Belgium is a tiny European country well-known for chocolates, loveable animated characters like the Smufs and Tintin, beer and of course waffles. 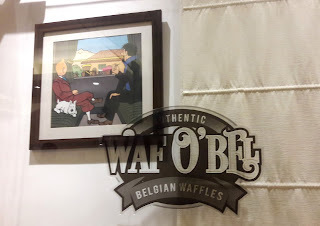 There's a bit of Belgium in Chennai, at Waf O'Bel at Harrington Road. The building the café is located in looks deserted but there is a piece of paper stuck beside the lift with Waf O'Bel printed on it and an arrow pointing up. It's on the 2nd floor but once inside, we make the connection. 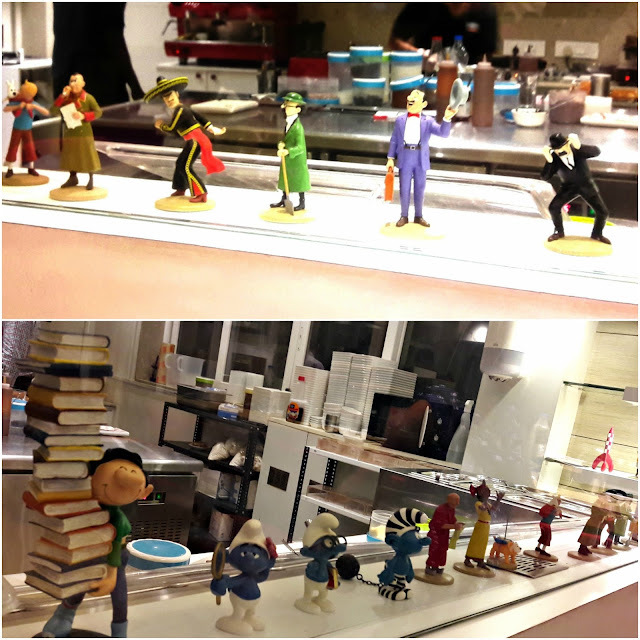 The smell of waffles is a magnet, figurines of the Smurfs and characters in the Tintin series are lined up against the open kitchen counter. 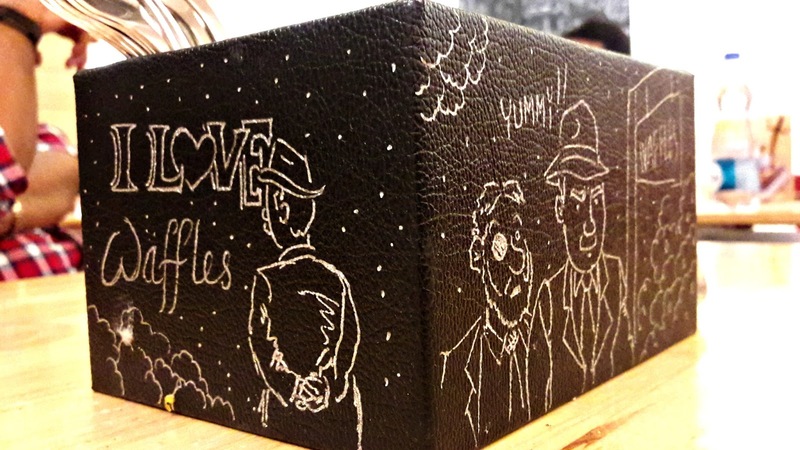 The menu is written on a chalk board and it's all cheery. And hot, thanks to a malfunctioning air conditioning system. Fortunately, things get set right soon. If fine chocolate is on any menu, you can be sure that Nitin Chordia, Chief Tasting Officer of Cocoatrait and a certified chocolate taster can't be too far behind. 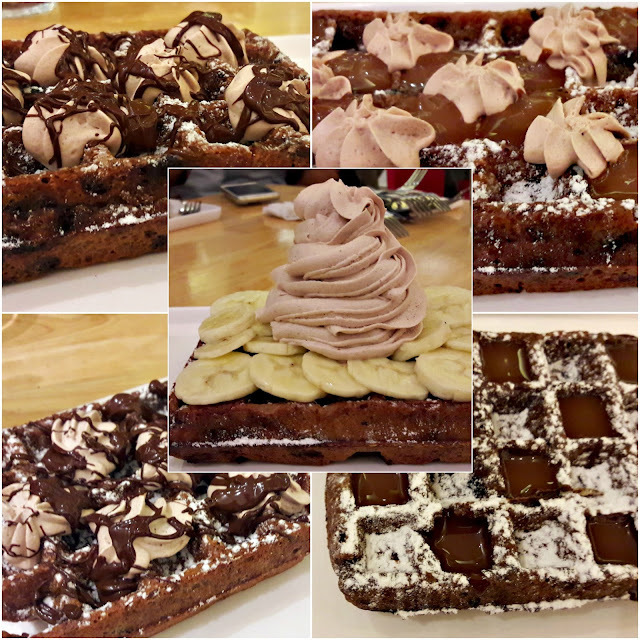 Cocoatrait and Waf O'Bel have joined forces to launch The Chocolate Waffle Festival where Indian non-alkalised cocoa and chocolate chips are incorporated into Belgian waffle batter. The highlight of this collaboration are 5 waffles that are in low calories, low in sugar and fat and vegan, just the thing to indulge in during the summer. Cocoa nib and almond waffle was the one I liked the best. Almonds are my favourite kind of nut; this batter had plenty of chopped nuts and cocoa nibs and the chocolate component was not as dominant as in the other batters. 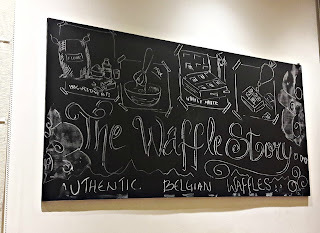 Plenty of chocolate sauce and vegan chocolate cream on the top ensured that every forkful of waffle could be twirled around the mounds of cream and sauce. Fudgy chocolate waffle was equally good. Semi-sweet chocolate chips gave the waffles a bit more sweetness and resulted in the waffle becoming more crisp as it cooled while the chocolate cream and sauce contributed to even more fudginess. Nib and chips had cocoa nibs and chocolate chips in the batter. The chocolate flavour was rather intense thanks to the nibs. Dusted with confectioner's sugar, some of the wells were filled with chocolate sauce which helped to tone down the intensity of the chocolate. Nib and coffee waffle was a perfect blend of chocolate and Arabica coffee. 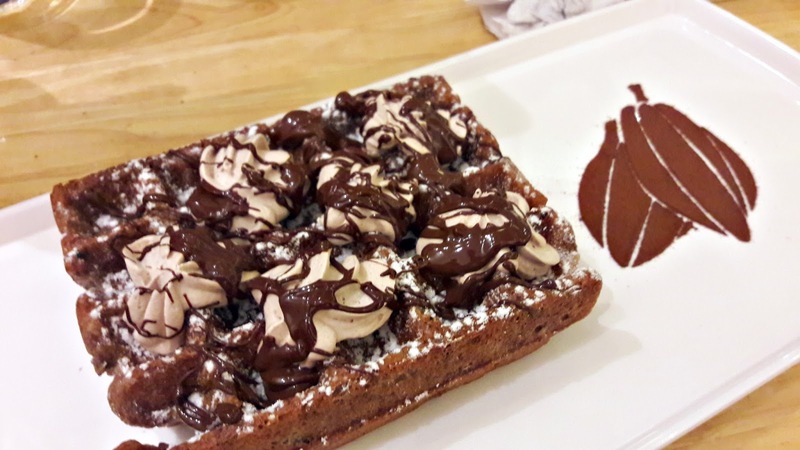 The waffle wells had chocolate sauce and the generous dusting of confectioner's sugar increased the overall sweetness a tad more, resulting in a lovely mocha flavour. I found the quantity of cacao and coffee nibs a bit too much for the amount of batter. 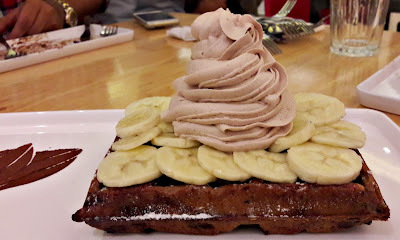 Peanut butter and choco waffle is a banana-covered waffle with a mound of peanut cream. Chocolate, PB and banana is a classic combination; although peanut butter had been incorporated into the waffle batter, it was the cream that dominated everything else. Some of my co-tasters loved this one. 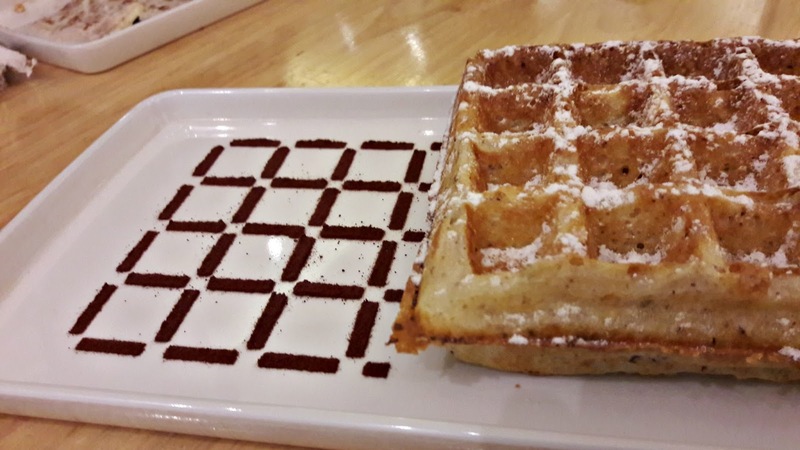 It's tough to taste 5 kinds of chocolate waffles so to relieve the monotony, we tasted Waf O'Bel's classic waffle -a light dusting of confectioner's sugar all over, crisp on the outside, soft inside and a tad under-cooked in the centre. Maybe the waffle iron was not hot enough. All the waffles are vegan and only a minimum quantity of sugar has been used in the batter. 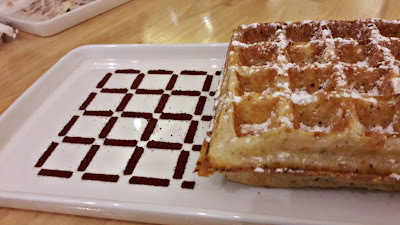 Each plate of waffle that came to the tasting table had a pretty design done with cocoa powder. At the end of the session, we had a look at the waffle irons. No wonder Waf O'Bel is serious about its quality. The Chocolate Waffle Festival will be on till the end of May 2017.